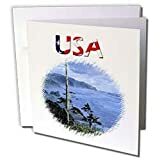 Digital Oil Painting of Oregon Coast with USA text design Greeting Card is measuring 5.5w x 5.5h. Greeting Cards are sold in sets of 6 or 12. Give these fun cards to your friends and family as gift cards, thank you notes, invitations or for any other occasion. Greeting Cards are blank inside and come with white envelopes.